Dulwich College International was proud to exhibit at today’s education showcase event in Shanghai, China: UK-China Future Classrooms, a prestigious event attended by British Prime Minister, Mrs Theresa May, who is currently in China for three days of talks and partnership deals in the education sector, together with the Chinese government. Invited by the British government, Dulwich College International showcased their advanced environmental curriculum and student leadership in the areas of STEAM (Science, Technology, Engineering, Art, and Math) and environmental entrepreneurship. 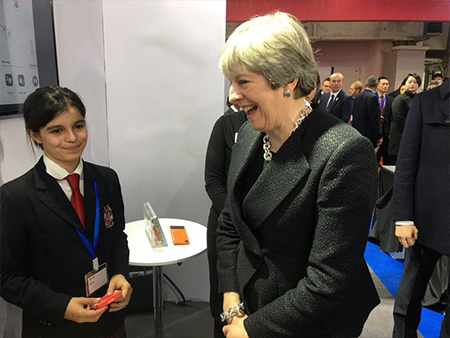 Dulwich Shanghai students were honoured to guide Prime Minister May around their virtual classrooms, highlighting to Mrs May their own personal experiences of student engagement and student leadership in the areas of environmental entrepreneurship. 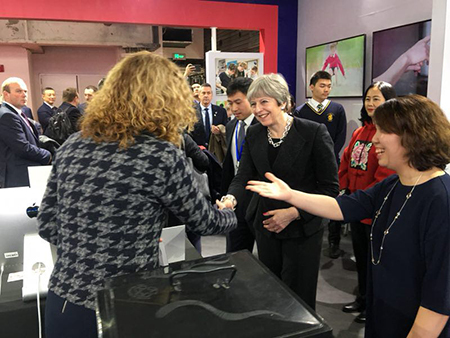 Leaders from Dulwich College Shanghai spoke at length with Prime Minister May about Dulwich College International's global commitment to STEAM, as well as Eco Entrepreneurship – a curriculum initiative which is now recognised as a new normal for its students. Ms. Caroline Taylor, Head of College at Dulwich College Shanghai Pudong, on speaking with Prime Minister May: "The Prime Minister and I talked about the focus on environmental and sustainability projects in our schools and our focus on creating future global leaders who have the skill set to make a difference. I also shared that Dulwich had achieved the silver award as an eco school." Dulwich College International was the first British independent school network to operate in China and has a highly successful academic track record for educating international students who go on to attend the UK’s finest university institutions. Prime Minister May was extremely complimentary of the commitment and progress that we have displayed over the past 14 years, highlighting Dulwich College International's famous heritage for curriculum innovation and progressive academic approach as part of the founding London school, Dulwich College’s 400 year old DNA.